Today I'm barking about my English Springer Spaniel, Gordon Setter, and Vizsla dog breed jewelry. You may have noticed that many of the dog breeds are sold out at For Love of a Dog Jewelry. Right now I have a few really pawsome pieces still available in these three dog breed. You probably should hurry and snap up some bargains in my huge sale. These make really special Christmas gifts for the dog lovers on your holiday shopping list! 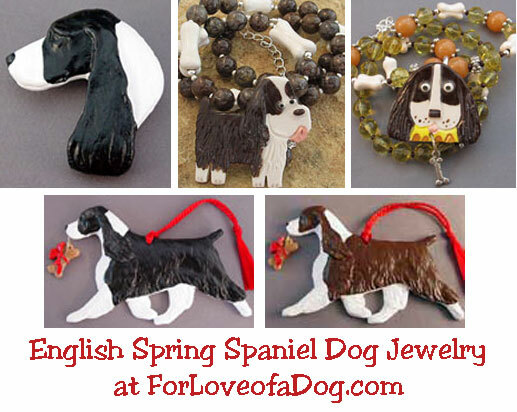 Shown at top is my English Springer Spaniel dog jewelry collection. There are 2 really wonderful necklaces, 1 pin, and even 2 Springer Spaniel dog Christmas ornaments available. 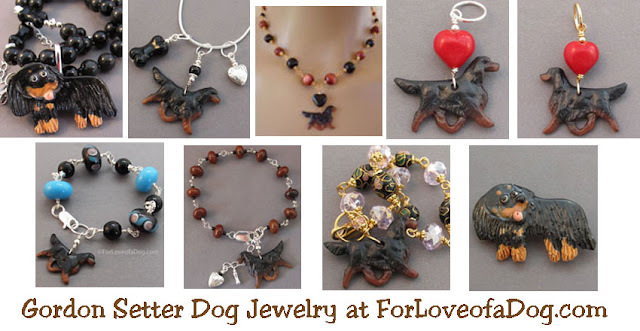 There's a bit more selection in my Gordon Setter dog jewelry collection: 3 necklaces, 2 pendants, 3 bracelets and 1 Gordon Setter puppy dog pin. You really better hurry if you're shopping for Vizsla dog jewelry. I have only 2 Vizsla puppy dog pins and 1 Vizsla dog necklace available as I write this. Shop For Love of a Dog now for best selection and don't miss our Black Friday and Cyber Monday sales on perfect gifts for dog, cat and horse lovers!